Marriage*: She married Alonzo Jerome Heflin on 18 November 1920 in Stamford, Jones County, Texas. Burial*: Interment was in Houston, Harris County, Texas. Note*: They lived in Houston, Texas. [S11] Index to Texas Death Records (Austin, Tex. : Tex. Dept. of Health, Bur. of Vital Statistics), typescript, 1964-1988 (microfiche), p. 18442, file 69821-84. [S312] Social Security Death Index, online at http://tinyurl.com/AncestrySSDI, viewed on 18 Mar 1998 (stating that she died in Jul 1984; not naming the place of death but stating that she lived in Houston, Texas when she died). Birth*: He was born on 21 September 1891. Marriage*: He married Bessie Mae Loop, daughter of Lucian Lloyd Loop and Bertha Mae Curtis, on 18 November 1920 in Stamford, Jones County, Texas. Note*: He was a plumbing contractor. [S11] Index to Texas Death Records (Austin, Tex. : Tex. Dept. of Health, Bur. of Vital Statistics), typescript, 1956, vol. 2, p. 539, file 2761. Marriage*: He married Frances Imogene Bullington, daughter of William Franklin Bullington and Fanny Catherine ('Fanny Kate') McFarlin, on 22 February 1921 in Stamford, Jones County, Texas. Burial*: Interment was in Forest Park Cemetery, Houston, Harris County, Texas. Note*: He was a plumber and real estate agent. He served in the U.S. Navy in World War II (as a Seabee) and World War I. [S1178] Standard certificate of death (Texas Department of Health, Bureau of Vital Statistics), no. 28153 for Lloyd Franklin Loop, filed 11 Jun 1938, R. L. Loop, informant, per copy viewed online at pilot.familysearch.org on 4 Jul 2008 (stating that he was born in Texas without giving the date or location). [S11] Index to Texas Death Records (Austin, Tex. : Tex. Dept. of Health, Bur. of Vital Statistics), typescript, 1972, vol. 2, p. 949, file 51747. [S312] Social Security Death Index, online at http://tinyurl.com/AncestrySSDI, viewed on 20 Mar 1998 (stating that he died in Jul 1972; not naming the place of death but stating that he lived in Houston, Texas when he died). [S1559] Texas Death Index, 1964-1998, online at https://www.familysearch.org, record for Riley Lloyd Loop, viewed on 28 Jan 2019. [S281] Robin Abb, 734 Holiday, Sherman, Tex. 75090, letter to Roger Bartlett, 25 Aug 1997, (naming Riley Lloyd Loop as her father). [S1178] Standard certificate of death (Texas Department of Health, Bureau of Vital Statistics), no. 28153 for Lloyd Franklin Loop, filed 11 Jun 1938, R. L. Loop, informant, per copy viewed online at pilot.familysearch.org on 4 Jul 2008 (naming R. L. Loop as his father). Marriage*: She married Riley Lloyd Loop, son of Lucian Lloyd Loop and Bertha Mae Curtis, on 22 February 1921 in Stamford, Jones County, Texas. Death*: She died on 14 August 1971 in Houston, Harris County, Texas, at age 73. [S282] Birth certificate for Frances Imogene Bullington, above. [S1178] Standard certificate of death (Texas Department of Health, Bureau of Vital Statistics), no. 28153 for Lloyd Franklin Loop, filed 11 Jun 1938, R. L. Loop, informant, per copy viewed online at pilot.familysearch.org on 4 Jul 2008 (stating that she was born in Texas without giving the date or location). [S281] Robin Abb, 734 Holiday, Sherman, Tex. 75090, letter to Roger Bartlett, 25 Aug 1997, (naming Francis [sic] Loop as her mother). [S1178] Standard certificate of death (Texas Department of Health, Bureau of Vital Statistics), no. 28153 for Lloyd Franklin Loop, filed 11 Jun 1938, R. L. Loop, informant, per copy viewed online at pilot.familysearch.org on 4 Jul 2008 (naming Frances Imogene Bullington as his mother). Marriage*: She married Robert G. ('Bob') Abb on 24 August 1946 in Kansas City, Wyandotte County, Kansas. [S281] Robin Abb, 25 Aug 1997 letter, above, (naming Francis [sic] Loop as her mother). [S281] Robin Abb, 25 Aug 1997 letter, above. [S312] Social Security Death Index, online at http://tinyurl.com/AncestrySSDI, viewed on 20 Mar 1998 (not naming the place of death but stating that she lived in Sherman, Texas when she died). Marriage*: He married Margaret Louise ('Maggie') Loop, daughter of Riley Lloyd Loop and Frances Imogene Bullington, on 24 August 1946 in Kansas City, Wyandotte County, Kansas. Note*: He owned Bob Abb Sales Co. in Sherman and traveled in six states as a representative for sporting goods, primarily fishing tackle. He retired after thirty-five years in sales. [S312] Social Security Death Index, online at http://tinyurl.com/AncestrySSDI, viewed on 24 Feb 1998 (stating that he died in Aug 1982; not naming the place of death but stating that he lived in Sherman, Texas when he died). [S281] Robin Abb, 25 Aug 1997 letter, above, (stating that his body was donated to medical science and his ashes were interred at Arlington National Cemetery). [S1178] Standard certificate of death (Texas Department of Health, Bureau of Vital Statistics), no. 28153 for Lloyd Franklin Loop, filed 11 Jun 1938, R. L. Loop, informant, per copy viewed online at pilot.familysearch.org on 4 Jul 2008. [S11] Index to Texas Death Records (Austin, Tex. : Tex. Dept. of Health, Bur. of Vital Statistics), typescript, 1903-1940, vol. 31, p. 15101, file 28153 (giving the date and county). [S1178] Standard certificate of death (Texas Department of Health, Bureau of Vital Statistics), no. 28153 for Lloyd Franklin Loop, filed 11 Jun 1938, R. L. Loop, informant, per copy viewed online at pilot.familysearch.org on 4 Jul 2008 (stating that he died at his home at 3:30 p.m. on 9 Jun 1938 from accidental strangulation). [S312] Social Security Death Index, online at http://tinyurl.com/AncestrySSDI, viewed on 18 Mar 1998 (giving her name as Gene Loop and giving only the date). [S281] Robin Abb, 734 Holiday, Sherman, Tex. 75090, letter to Roger Bartlett, 25 Aug 1997, (giving the date but not the place). [S312] Social Security Death Index, online at http://tinyurl.com/AncestrySSDI, viewed on 18 Mar 1998 (giving her name as Gene Loop and giving the date but not the place). [S1547] Texas Deaths, 1964-1998, online at https://www.familysearch.org, record for Frances Imogene Loop, viewed on 25 Jan 2019. [S281] Robin Abb, 25 Aug 1997 letter, above, (calling her Gene Loop). "Sarge" Hickman's tombstone, Highland Cemetery, Stamford, Tex., courtesy of Carla Young. Marriage*: She married Henry Clay Hickman on 17 October 1917 in Dallas, Dallas County, Texas. Other Names*: Etta Loop, Etta Hickman, Sarge Hickman. Note*: She was a master sergeant in the U.S. Air Force (1942-1964) and a hospital nurse and was known to some as 'Sarge.' She lived in Stamford, Texas. • Her page on Find A Grave is here. [S1108] Social Security Death Index, online at http://tinyurl.com/RootswebSSDI, Amelia H. Hickman, viewed on 25 Jul 2011 (giving the date but not the place). 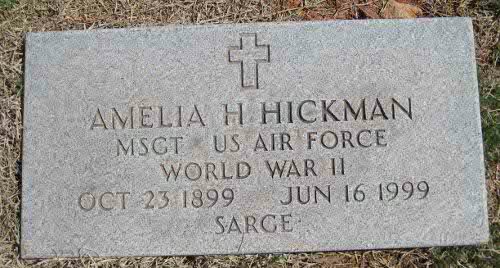 [S961] Find A Grave, online at http://www.findagrave.com, memorial for Amelia Henrietta 'Sarge' Hickman, memorial no. 41318427, viewed on 25 Jul 2011 (giving the date but not the place). [S1108] Social Security Death Index, online at http://tinyurl.com/RootswebSSDI, Amelia H. Hickman, viewed on 25 Jul 2011 (not naming the place but stating that she lived in Kingsland, Texas when she died). [S961] Find A Grave, online, above, memorial for Amelia Henrietta 'Sarge' Hickman, memorial no. 41318427, viewed on 25 Jul 2011. Birth*: He was born on 27 September 1890 in Mississippi. Marriage*: He married MSGT Amelia Henrietta ('Etta') Loop, daughter of Lucian Lloyd Loop and Bertha Mae Curtis, on 17 October 1917 in Dallas, Dallas County, Texas. Note*: He was a packing house foreman. [S1256] California Death Index, online at http://tinyurl.com/om9mmen, Henry Clay Hickman, viewed on 2 Aug 2013. [S312] Social Security Death Index, online at http://tinyurl.com/AncestrySSDI, Lloyd H. Hickman, viewed on 2 Aug 2013 (giving the date but not the place). [S312] Social Security Death Index, online at http://tinyurl.com/AncestrySSDI, Lloyd H. Hickman, viewed on 2 Aug 2013 (stating that he died on 2 Mar 2002; not naming the place of death but stating that he lived in Hialeah, Fla. when he died). [S312] Social Security Death Index, online at http://tinyurl.com/AncestrySSDI, Lloyd H. Hickman, viewed on 2 Aug 2013 (stating he lived in Hialeah, Fla. when he died). Birth*: He was born on 1 April 1902 in Roane, Navarro County, Texas. Marriage*: He married Jane Miller on 29 June 1930 in Fairmont, Marion County, West Virginia. Death*: He died on 14 September 1958 in New Orleans, Orleans Parish, Louisiana, at age 56. Burial*: Interment was in New Orleans, Orleans Parish, Louisiana. Note*: He was a cotton and stock broker in New Orleans. He was captain of the University of Texas track team in the early 1920's and held the state one-mile record in track. Birth*: She was born in Fairmont, Marion County, West Virginia. Marriage*: She married Thomas Franklin Loop, son of Lucian Lloyd Loop and Bertha Mae Curtis, on 29 June 1930 in Fairmont, Marion County, West Virginia. Burial*: Interment was in 1954 in New Orleans, Orleans Parish, Louisiana. Death*: She died in 1954 in New Orleans, Orleans Parish, Louisiana. Birth*: He was born on 7 September 1937 in New Orleans, Orleans Parish, Louisiana. Death*: He died in May 1994 at age 56. Note*: He owned a salvage operation at New Orleans, Louisiana. [S961] Find A Grave, online at http://www.findagrave.com, memorial for Ann Higgins Loop, memorial no. 106606004, viewed on 6 Jul 2014. Other Names*: Ann Higgins Loop, Ann Loop. [S961] Find A Grave, online, above, memorial for Ann Higgins Loop, memorial no. 106606004, viewed on 6 Jul 2014 (naming Edward O. Higgins as her father). [S961] Find A Grave, online, above, memorial for Ann Higgins Loop, memorial no. 106606004, viewed on 6 Jul 2014. Ruby Loop Howse's tombstone, Highland Cemetery, Stamford, Tex., courtesy of Carla Young. Note*: She was a hospital aide and sitter and lived in Stamford, Texas. [S961] Find A Grave, online at http://www.findagrave.com, memorial for Ruby Edel Loop Howse, memorial no. 40387100, viewed on 25 Jul 2011 (giving the date but not the place). [S11] Index to Texas Death Records (Austin, Tex. : Tex. Dept. of Health, Bur. of Vital Statistics), typescript, 1991 (microfiche), p. 993, file 79374. [S312] Social Security Death Index, online at http://tinyurl.com/AncestrySSDI, viewed on 20 Mar 1998 (not naming the place of death but stating that she lived in Stamford, Texas when she died). [S961] Find A Grave, online, above, memorial for Ruby Edel Loop Howse, memorial no. 40387100, viewed on 25 Jul 2011. 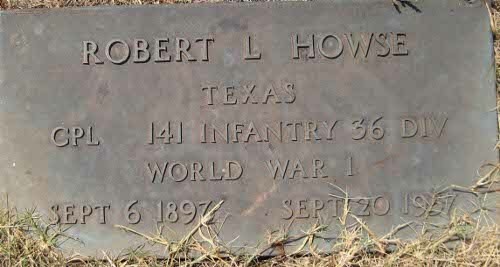 Robert L. Howse's tombstone, Highland Cemetery, Stamford, Tex., courtesy of Carla Young. Note*: He was a carpenter. [S772] Dorothy Norman, Rt. 1, Box 292-H, Kingsland, Tex. 78639, letter to Roger Bartlett, 13 Dec 1994, (naming Claude A. Howse as his father). [S772] Dorothy Norman, 13 Dec 1994 letter, above, (naming Molly Ruff as his mother). [S961] Find A Grave, online at http://www.findagrave.com, memorial for Robert Lorene Howse, memorial no. 40387050, viewed on 25 Jul 2011 (giving the date but not the place). [S772] Dorothy Norman, 13 Dec 1994 letter, above. [S11] Index to Texas Death Records (Austin, Tex. : Tex. Dept. of Health, Bur. of Vital Statistics), typescript, 1957, vol. 2, p. 615, file 50492 (misstating his name as House). [S961] Find A Grave, online, above, memorial for Robert Lorene Howse, memorial no. 40387050, viewed on 25 Jul 2011.